Desiring to delude myself into feeling better about Hong Kong’s air quality (currently at the red/high/unhealthy level), I started browsing air qualities in other cities. Viewing the air quality in say, Amsterdam or Seattle, was a total kill-joy. Viewing the average air quality in Shanghai or Beijing, however, encouraged me to take a long, deep breath of Hong Kong’s fresh grey air. As “Asia’s World City” what’s stopping us from besting our Shanghai rival by adopting a super cool pictorial AQI to track the damaging effects of the air we breathe? Fingers crossed that the Bruce Lee AQI will be at either “Awesome” or “Pretty good” for the half marathon. That gave me a good laugh. I hope they adopt your idea! Wouldn’t it be really cool if they did? Glad you enjoyed this post. Great idea! I hope one day Chengdu will adopt your visuals too (maybe with the panda), we surely need it! See http://wp.me/pZcVJ-pr. Reading your post about Chengdu’s air has encouraged me to go for a nice, long run even though we’re at “Air is bad” on the Bruce Lee AQI. My god, the readings for Chengdu are horrible! I love the idea of a “Panda Index” but fear the little guy would be perpetually on the verge of death. Maybe a little face mask on the panda for AQIs over 150 would make it work. Your proposed Bruce Lee Index is way less creepy than the little girl. Of course, as she lacks a nose, I don’t know if I’d trust her assessments anyway. Her lack of a nose is a particularly keen observation. Great point! HAlarious. 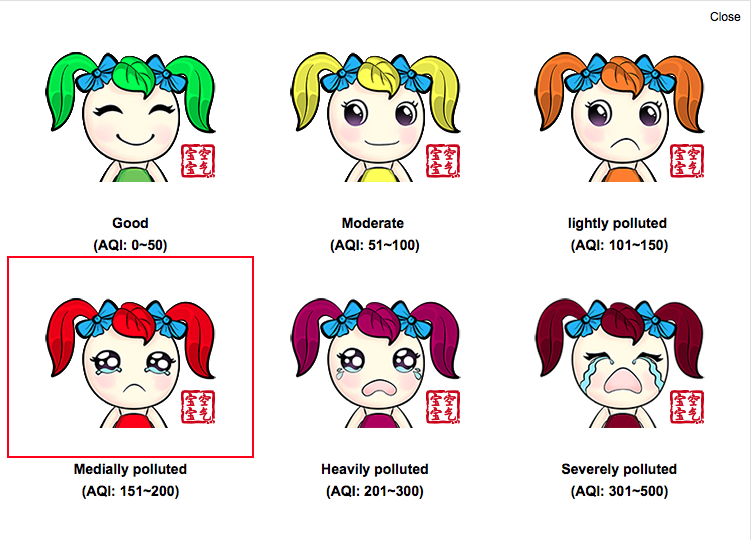 What has HK done to promote pollution control, BTW? Are there restrictions on the number of motor vehicle licenses given out each year, annual car smog checks? And what about people burning incense and paper money/garbage/their marriage certificates? From what I can tell Hong Kong has fallen back on the usual non-solution of blaming Mainland China for everything. Cars do have yearly smog checks and the taxis use a cleaner burning fuel. There is some talk of cleaning up the buses. Obviously not quite enough us being done. That big sun LED screen it too much! I have also heard that Beijing limits which days certain cars can drive. In Hong Kong there is nothing like that, but I also think there are a lot fewer private cars in Hong Kong than Beijing. Buses, trucks, cargo ships and air traffic are all big local polluters here (plus whatever blows down from Guangdong Province). How’s the air in Latvia these days? Thanks very much! How is the air in Chicago? Some days I really miss the bright, blue sky in Cambridge. curious, looking out the very fresh HK air, do you ever miss seeing Mt. Rainier (or Mt. St. Helens) from the top of the needle of where you are from? Yes, i do miss Seattle’s fresh air and the view of Mt Rainer! Fortunately I have the chance to visit every summer. For the time being, fingers crossed the wind in Hong Kong picks up and blows out some of this pollution. Yes, the issue of building housing estates in the country parks is a real drag and disappointing. Living in Shanghai – take another run for me! Wish I were there. Spent last week in Singapore enjoying the air! I just checked again and it looks like Shanghai has cleaner air today than us! Breathe deep and enjoy it! That post led to an actual, real-life LOL. Awesome. I can’t think of a single thing that should be stopping that. Gosh, makes the kerfuffle we had over the Sumatran forest fires in 2013 look pretty pale (by which I mean “colourless” I guess). People were literally fleeing the country and the government was doing the modern equivalent of pasting up Keep Calm And Carry On posters, and at the same time trying to sound appropriately alarmist and disapproving of the Indonesian fire-lighters. Thought I’d let you know my husband sent this to the Hong Kong team. He had to make it into a (properly credited) file, upload the file at work and then circulate it as an attachment using his work account in order to bypass the corporate internet nanny who disproves of fun, but he thought it was important to do so. He hopes they feel he’s sympathetically cheering them through their suffering, and not unsympathetically sniggering at them from a safe distance through their suffering. Hey, what a compliment: worth busting company protocol to share! Luckily we enjoyed some nice air over the weekend! Is that girl crying in the Shanghai index or is the acid rain slowly melting her eyeballs? Another beautiful, blue sky day in HK today though. Hiking time before the pall descends once more. Ha! Good point about her face possibly melting. Right now I am enjoying blue, but very cold (for me) winter weather in Istanbul. Fingers crossed for more, cool-ish, but clear days of days of hiking this spring in HK! Your Bruce Lee AQI idea inspired me. Thanks for sharing your Star Wars AQI interpretation! As someone who lives in Beijing and occasionally travels to HK for the fresh air and lower risk of death by traffic, I found this exceeding funny. And sent it to all my Beijing friends. 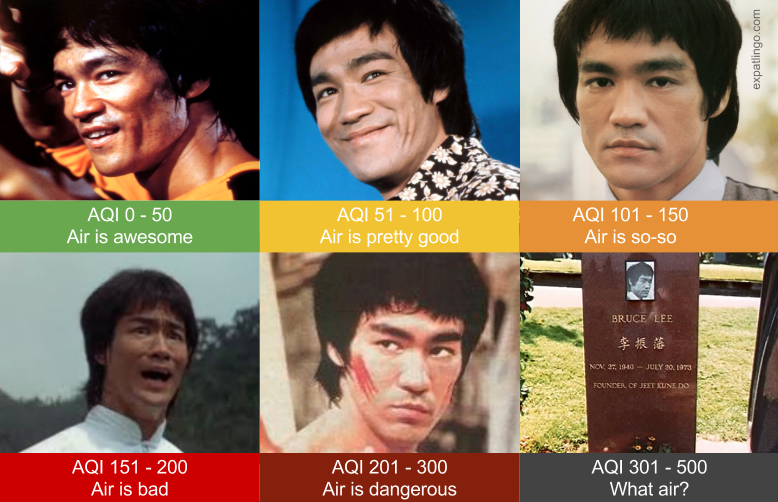 We recommend the adoption of the Bruce Lee AQI immediately.